She is a bringer of riches and wealth. She lives in rotting woodlands near poisonous toadstools. She wears red with white spots, like the toadstools. She has gentle green wings like a butterfly. Where I Buy My Stuff! First I want to share with you that yesterday's showing just might be the one! We received a phone call from our agent last night and said the people just loved it. They loved everything thing about it. So much that they couldn't understand why we would want to put it up for sale? Can you believe that? They wanted to know if we had a problem with our neighbors or what? The reason we are building a new condo is that we need more room. When we down-sized to this condo all was taken into consideration with exception of my knitting and sewing. I have not been even able to have my sewing machine out since we moved in here. Our new condo will have a bonus room. Yea That I will have all for me. I just can't wait. It will be great. Please keep your fingers crossed for us!!! You are currently watching The Pink Panther. It is TVyarn brought to you by White Oak Studio. I really like this ultra soft and pettable sock yarn. If you look close, you can see a very pretty stitch marker on the label. Thank you for that Jana. Now, click on this and go to her etsy shop to check out all her TV program yarns. 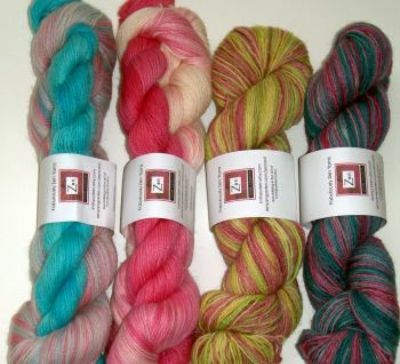 All of these yarns are Fabulously Zen Yarns from Zen Yarn Garden. You can purchase these yarns from her Etsy Shop and from her Zen Cart. Gosh, what can I say about these yarns except gorgeous, wonderful, yummy...on and on! I'll introduce them to you. Let's see (from left to right) The first two are her In-Sync Sock yarns. They have coordinating toe/heel yarn. Colourway for first is Strawberry Blonde and then Margaritaville. The next two are in her Superwash BFL Yarn yarns. Colourway for these are Bright Pearl and then Cosmopolitan. I hope you have enjoyed what I brought to Show N' Tell today. Please don't forget to keep your fingers crossed. May you have a truly pink day. YOU CAN HAVE MY BUTTON! This is a Flickr badge showing photos in a set called Felted Flock. Make your own badge here. How bout a lil drinky while you wash your socks? What's Mama Up To Fridays. Are you Call'n Me Lazy? Maybe I'll set Friday's aside for things I have found that are "interesting". Look at my pretty yarn bowl!! I have a secret to tell you. She's back!! !